It’s also surprising because this is usually our excuse for not following authority–especially spiritual and moral leaders. Whenever what leaders say do not match what they do, we grab the opportunity to point this out and declare that they are not credible. After all, how can these preachers be credible if they fail to practice what they preach? I’ve heard many of my friends declare that the reason why they’ve refused to go to church or why they’ve stopped believing in God is that for them, the Church no longer enjoys any credibility or respect, given recent exposes and scandals involving their authorities. So why listen to their words when their actions–so much more loudly–tell us otherwise? Of course they have a point. Leaders and teachers–especially religious and moral leaders and teachers–are expected to practice–and model–what they exhort their followers to do. As educationalist, Parker Palmer, puts it, “We teach who we are.” More than what we say, it’s our modelling of what we teach that makes the greatest impact on our students and followers. When we fail to do that, we lose credibility, and others will find it difficult to believe in us, not to say anything about doing what we ask them to do. When there is a gap between someone’s preaching and practice, we ought to call it out, the way the Lord does in today’s Gospel. But the Lord reminds us that it would be foolish to toss the baby out with the bathwater. Just because the messenger is not credible doesn’t necessarily mean that the message is false. We can’t simply use the messenger’s fault as an excuse to dismiss the message. In other words, just as the Lord tells us to practice what the Pharisees preach, their hypocrisy notwithstanding, we are being challenged to believe what is true and to do what is right, regardless of whose lips they may issue from. In speaking of the validity of the sacraments, St. Augustine used the Latin phrase “ex opere operato,” which literally means “from the work worked.” What he means is that the Church’s sacraments remain efficacious regardless of their minister’s attitude or state of grace simply because they derive their validity and power not from their ministers, who are human and flawed, but from the work of the Lord. Such is the power of God’s grace. In a similar way, the Gospel that the Church preaches remains true and demands our full assent in spite of its very human and flawed messengers. 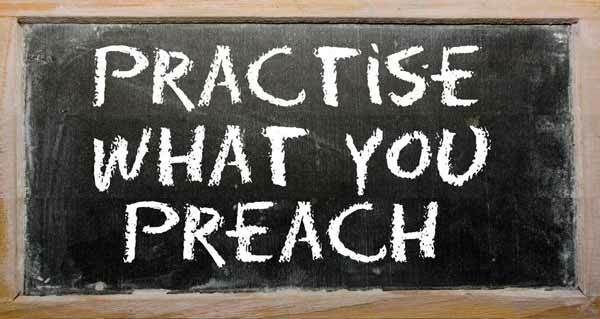 In other words, just as it is every preacher’s obligation to make every effort to practice what s/he preaches, it is also every believer’s obligation to practice what preachers preach, regardless of the preachers’ flaws.